Gaps in your smile can cause you to feel self-conscious and make normal activities, such as eating and speaking, more difficult. Dr. Jose Valenzuela Jr. can place and restore dental implants, the most stable and secure tooth replacement option available. So why should you choose implants? Implants support a strong, dense jaw and prevent teeth from shifting out of place. Dental implants remain fixed in the jaw, so restorations will never slip or shift. 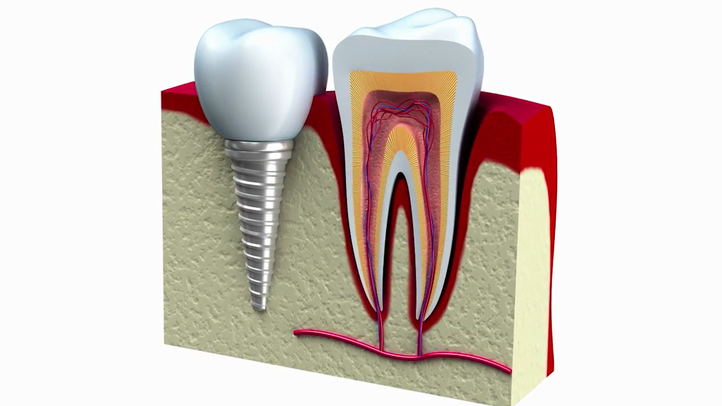 By replacing the entire missing structure, implants look and feel like natural teeth. At Cosmetic & Implant Dentistry Center, we use advanced dental technology to perform all stages of dental implant treatment. We first take a computer tomography (CT) scan, which is uploaded into our specialized design software. Using this information, Dr. Valenzuela can design a precise surgical guide before your procedure and print a 3-D model in the office. We offer a range of other state-of-the-art treatments, including immediate implant placement and PRGF® (Plasma Rich in Growth Factor), a technology which promotes faster healing after dental surgeries. But do I qualify for dental implants? Most patients who are missing one or more teeth qualify for dental implants. However, certain conditions can impact your candidacy for the treatment. Dr. Valenzuela can assess your oral health during an initial consultation at our office and recommend procedures to restore your candidacy for dental implants. We offer grafting procedures to replace lost bone tissue for better implant stability. Scaling and root planing and other treatments can restore your gum health. We recommend quitting smoking as it increases your chance of implant failure. Uncontrolled diabetes, pregnancy, and immune issues can limit implant candidacy. Dr. Valenzuela discusses implant candidacy as well as the treatment process. Once everything is finished, how will my smile look? Before - This patient was missing a single tooth. After - We replaced it with a single implant zirconia crown. Dr. Valenzuela believes that implant dentistry should be available to everyone, regardless of their budget. We provide many of the same services as dentists in the U.S. at a fraction of the price. Posts are priced individually, so multiple implants will cost more overall. If you need preparatory procedures, such as a graft, your final bill will be higher. A full denture will typically cost more than a single implant or a small bridge. IV sedation can ensure your comfort, but will raise your treatment cost. PRGF can help you heal faster and also carries an additional fee. While implant-supported restorations do cost more than other tooth replacement options, they are an investment in your long-term oral health. With implants, you can enjoy unparalleled stability as well as a healthier jawbone and an overall stronger smile. I just love how professional & clean this office & staff are! 2 out if 3 visits! Getting all in 6 implants! Love their work & prices too!